If her grandma name is Gigi, she is in for a treat! With our creation of gifts for gigi, she will be delighted with products featuring her own special grandma name. 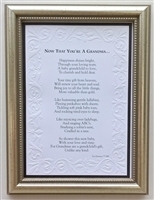 For an even greater selection of gigi gifts, shop our personalized grandparent gifts and add her name to one of our grandparent gifts. Think of Gigi on her birthday, Christmas or other special day you want to let Gigi know how much you love her!